KUALA LUMPUR, Malaysia -- Malaysian officials said Sunday that they would seek help from territories near the island where a suspected piece of the missing Malaysia Airlines jet was discovered to try to find more plane debris. 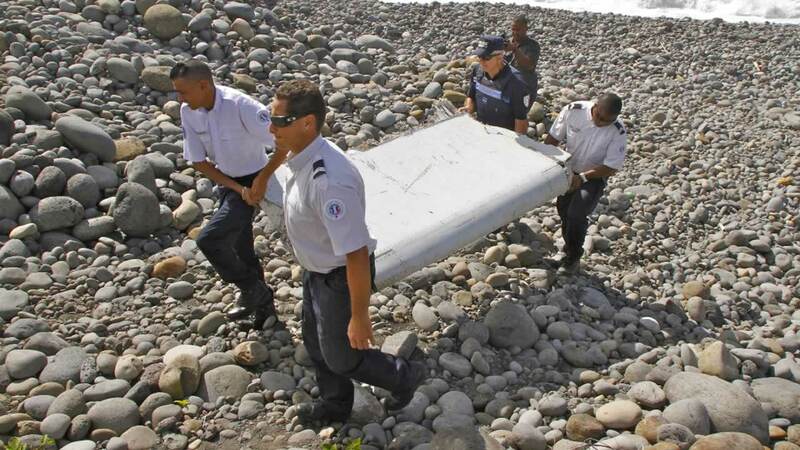 A new piece of debris, meanwhile, found on Sunday on the French island of Reunion in the western Indian Ocean turned out to be a "domestic ladder," and doesn't belong to a plane, Malaysian Director General of Civil Aviation Azharuddin Abdul Rahman told The Associated Press amid media reports that a new plane part was found. Malaysian government officials will ask territories near Reunion to alert them if they find any debris that could be from a plane, a transport ministry official said on condition of anonymity because he wasn't authorized to speak to the media. A wing flap suspected to be from the missing Malaysia Airlines Flight 370 was found Wednesday on Reunion. It arrived Saturday at a French military testing facility, where it will be analyzed by experts. Air safety investigators, including one from Boeing, have identified the component as a flaperon from the trailing edge of a Boeing 777 wing, a U.S. official has said. Flight 370 is the only missing 777 and many are convinced the flap comes from the ill-fated jet. The new piece of debris found on a beach near the town of Saint-Denis on Sunday morning had nothing to do with the investigation involving the missing Malaysia Airlines Flight 370, Rahman said. "I'm the one leading the investigation in France for the analysis of the (wing flap) piece brought back. I read all over media it (the new debris) was part of a door," he told the AP by phone from France. "But I checked with the Civil Aviation Authority, and people on the ground in Reunion, and it was just a domestic ladder." Malaysia's transport ministry confirmed Sunday that the flaperon that was found has been identified as being from a 777, saying it had been verified by French authorities together with Boeing, the U.S. National Transportation Safety Board and a Malaysian team. Experts will try to establish whether the part comes from Flight 370, which disappeared on March 8, 2014, while en route from Kuala Lumpur to Beijing with 239 people on board. Malaysian Transport Minister Liow Tiong Lai said in a statement Sunday that representatives from Malaysia, the U.S., China, France and Boeing would take part in the verification of the flaperon. About two-thirds of those aboard Flight 370 were Chinese. Liow said Malaysia's Department of Civil Aviation was reaching out to authorities in territories near Reunion to allow experts "to conduct more substantive analysis should there be more debris coming on to land, providing us more clues to the missing aircraft."